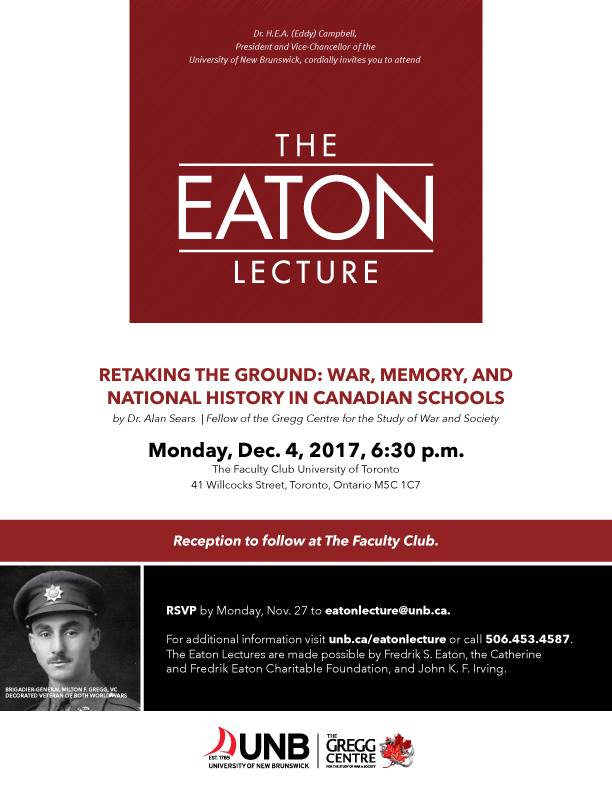 Dr. Alan Sears will be presenting on “Retaking the Ground: War, Memory, and National History in Canadian Schools” on 4 December 2017 at the Faculty Club University of Toronto (see poster below for further details). In the 2017 Eaton Lecture Dr. Sears will argue that history has lost ground in school curricula in several ways. First, it is given low priority vis-à-vis other subjects deemed more important, notably literacy and numeracy. Second, it has often been dominated by icon builders who teach a rote, noncritical history that is not adequate for contemporary citizenship. Drawing on recent scholarship and practice in history education around the world and, in particular, from work at the Gregg Centre, Dr. Sears will make the case for teaching a complex and contested history of war and society as a key element in fostering engaged and thoughtful civic participation. Dr. Alan Sears is a Professor of Social Studies Education in the Faculty of Education at UNB and a Fellow of the Gregg Centre for the Study of War and Society. In 2011 Alan began collaborating with colleagues in the Gregg Centre to develop a graduate education course on the teaching of Canadian history built around the Centre’s teacher professional development program. The program uses an overseas study tour model to immerse teachers in the First and Second World Wars and in Canada’s role around the world ever since. That course was first offered in the summer in the summer of 2012 and is now a regular part of the program. Alan has been a social studies teacher for more than 30 years working at all levels from primary to graduate school. In the Faculty of Education at UNB Alan teaches undergraduate courses in teaching methods, social studies education, and international education and graduate courses in research methods and educational policy. He also regularly supervises PhD and MEd students. Alan’s research and writing have been in the fields of social studies, citizenship education, and history education. He has authored more than 50 articles and book chapters and as well as authoring and editing both academic books and school textbooks. Alan is Editor of the journal Citizenship Teaching and Learning. His books include Globalization, the Nation-State and the Citizen: Dilemmas and Directions for Civics and Citizenship Education (co-editor) and Education, Politics and Religion: Reconciling the Civic and the Sacred in Education (coauthor) both published by Routledge. His most recent book, coauthored with a team from around the world is, Education, Globalization and The Nation published by Palgrave Macmillan.